Bitbook is down, avoid until further notice. 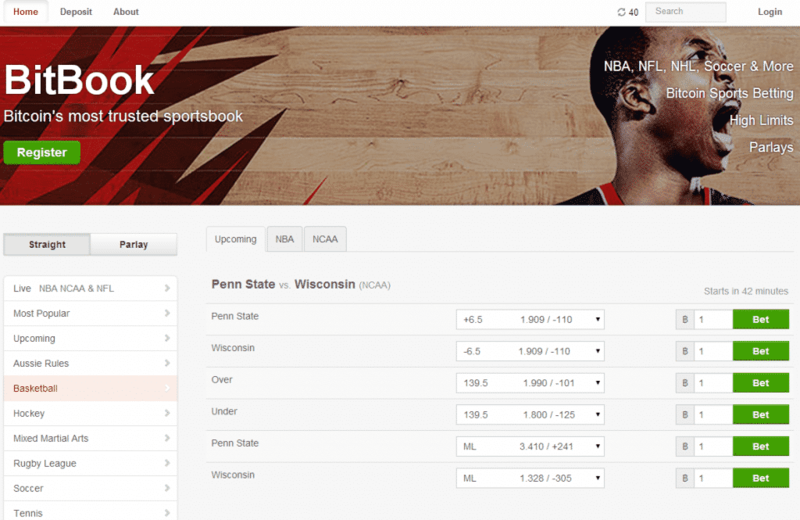 View our list of recommended bitcoin sportsbooks. On the rising Bitcoin sportsbook market, Bitbook is regarded highly by players and bet enthusiasts alike. This is due to several factors – firstly, Bitbook has a clear and inviting design that relies on simplicity and readability, even when browsed from a mobile device. Secondly, the site offers very high betting limits which should appeal to high rollers. Thirdly, there are extensive betting options available for fans of different sports and events and lastly, the security is top notch with Two-Factor Authentication. Having a clear and concessive layout with all the essential information prominently displayed is what Bitbook is going for and it servers them well. The design lacks a complicated theme and is void of animations and any kind of “eye candy” which might make it look simple, though it greatly boosts performance. 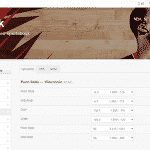 An option for personalization is also available, once the player profile has been created. This includes features such as different odds format display, one click betting as well as added protection with Two-Factor Authentication. Overall, Bitbook delivers a pleasant and informative betting experience, browsing the upcoming events and placing a bet from a mobile device, not having to refresh the site since it has a built-in automatic function that updates the information regularly. Bitbook.biz doesn’t offer any of the more complex and exotic types of bets such as teasers, propositions or futures, though what it has in store for bettors is more than adequate. This includes straight bets, parlays, live and half time betting (1H, 2H). Bet cancellation isn’t possible at Bitbook in order to keep players from abusing the system, though you can preset your profile to ask for a confirmation before placing a bet. The minimum bet at Bitbook is set very low, i.e. at 0.001 BTC, while the maximum is one of the industry best offering up to 50 BTC for all major tournaments and matches. Keep in mind that the maximum bet does fluctuate depending on the game and match, so you might find lower max bets for less significant matches and events. Around 90% of the matches and events are auto-graded, meaning the bets are automatically settled 30 minutes after the completion of the match / event. In some small instances including e-sports, MMA or smaller type events like tennis, this is handled manually. Basketball (NBA, Euro-basket, NCAA, etc). Upcoming events are highlighted on a daily and weekly basis, with most popular and demanded offers being featured prominently. As with most Bitcoin sportsbooks, you can only place bets and withdraw winnings by using Bitcoins. A Bitcoin wallet is sufficient to complete the account creation process and be considered eligible to start betting at Bitbook.biz. 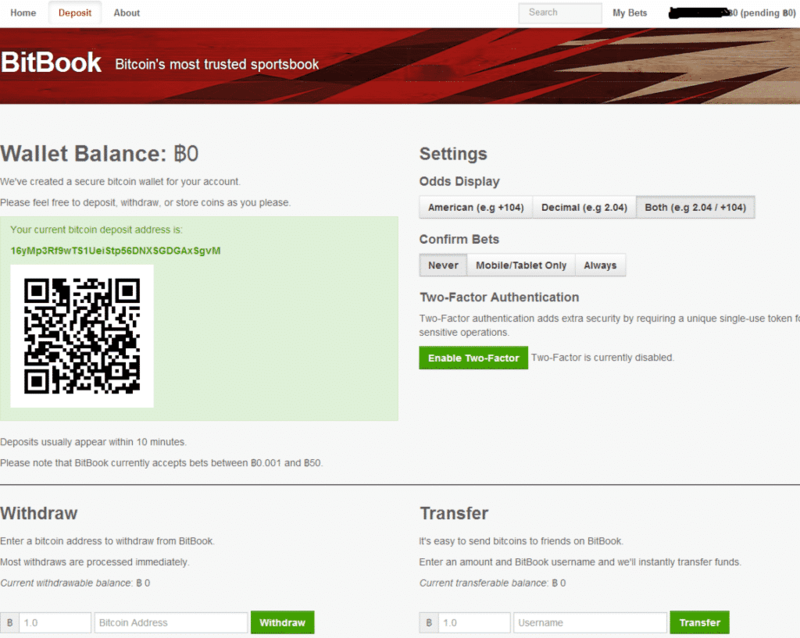 The site has even an option for transferring funds instantaneously to another Bitbook account. Most transactions are instantaneous when making deposits and withdrawals, with slight delays depending on the amount and traffic output on the site. The minimum withdrawal limit is set at 0.01 BTC though there is currently predetermined number for the maximum you can withdraw. Two-Factor Authentication is a smart way to enhance user protection on Bitcoin betting sites and Bitbook offers it to their user base. It involves two stages to verify the identity of the account holder which in turn, makes it very difficult for hackers to obtain access to the user’s account. The use of Bitcoins guarantees fast and secure payments and withdrawals, without the need to use sensitive information. Contacting the customer support at Bitbook is only possible through email at contactbitbok@husmail.com. The site representatives are quite diligent and respond quickly to questions so expect your issues to be resolved in less than 24 hours. Bitbook also provides a link to their official forum where bettors and players can read up on upcoming changes and share tips. Bitbook might lack some of the more comprehensive types of betting as well as just one mean to contact their customer support team, though it more than makes up with the wealth of available games and sheer range of bet limits. Thanks to their enhanced security through Two-Factor Authentication and more or less instantaneous deposits and withdrawals, they continue to supply more and more users with quality offers via easily accessible and highly optimized platform. You should definitely give Bitbook a try.